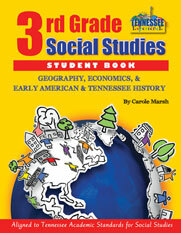 These print biography readers are available for historic figures listed in the Tennessee Social Studies Standards for grades K-5. Tennessee Experience 3rd Grade Biography Reader Set includes 30 packs of one title. Put a Reader in the hands of every student to build reading skills while covering essential social studies standards and content. These popular readers include easy-to-read information, fun facts and trivia, humor, activities and a whole lot more. Each reader will leave kids filled with heartfelt amazement and admiration. 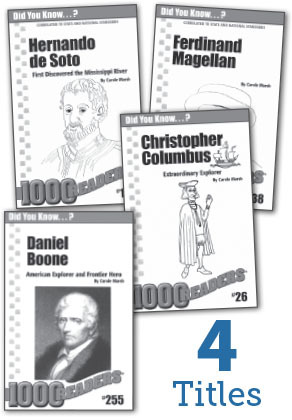 The Biography Readers highlight achievements and important events during each historic figures' lifetime! 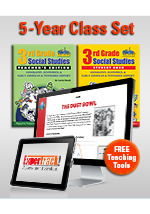 They build reading skills while covering essential social studies content. 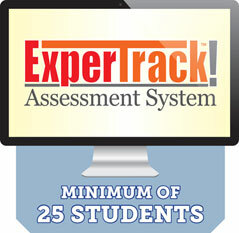 The Activities, fun facts, and quizzes help students increase comprehension and retain knowledge. Each story shows students the obstacles and hardships that many of our country's heroes had to overcome, their struggles, attempts, failures, perseverance, accomplishments and the ultimate success they achieved, taking their place in America's history. These books emphasize the roles of family and education, responsible decision-making, taking responsibility for oneself, civic responsibility, work ethic, self-motivation and more!